Below are some woodcuts of Yankee actor George "Yankee" Hill (1809-1849)in some of his more famous roles. 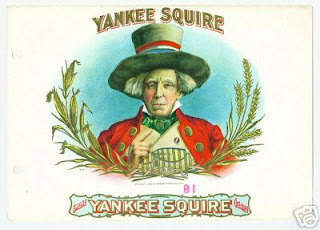 George Hill was the only famous stage Yankee who was actually a native of Yankee-land. He died young, only forty, but had already made a reputation for himself for Yankee stories, lectures, and dramatic roles. Before the Civil War, this uniform was more familiar as the outfit for the "Brother Jonathan" character. 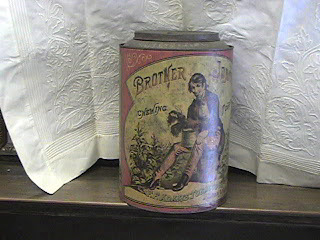 (See at left container for "Brother Jonathan Chewing Tobacco"). Brother Jonathan was the transatlantic cousin of John Bull -- the typical male citizen of the country -- the man on the street. Brother Jonathan looked much like Uncle Sam, except he would often have a feather in his cap (did this come from the song, or did the song cite an already familiar character?) The Civil War brought increased Federal departments and control, so Uncle Sam (U.S.), the personification of the government, became the dominant figure. *The woodcuts are images from Hill's book Scenes from the Life of an Actor (1853). It is available online; the link is listed on the left.